Featured in the Property Magazine of the Ham and High. Whitehall Park are developers focusing on residential and commercial properties in the North London area with a passion for an exceptional location and providing a true gem of a find. 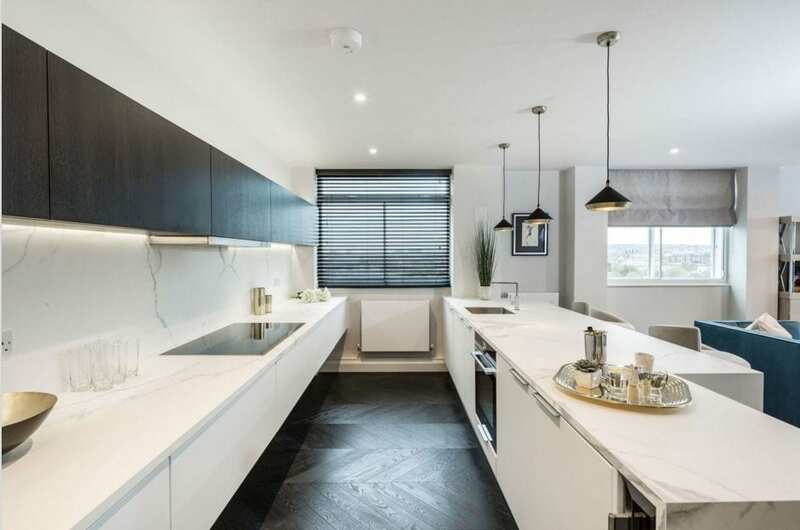 NW3 Interiors were asked to transform a dated top floor apartment to a modern turn-key masterpiece whilst also maximising the views of Lords Cricket Ground from every room. NW3 Interiors created a colour scheme and furniture collections which reflect traditional tastes alongside modern minimalism to appeal to potential buyers and assist in the swift sale of this property. The use of soft and neutral tones throughout create a wide appeal, using accent colours like gold and the electric blue in the sofa to add areas of interest. The majority of the pieces were sourced from our luxury brand partners. Using renowned brands to highlight the quality finish of the space and design. The textures were balanced using Arte wallpapers to create interest and warmth in various spaces. Like the 3-dimensional wallpaper used in the hallway and the printed wallpaper used behind the dining space. Lighting was another essential design element to add warmth and ambience to the space. Cool pendants over the marble units in the kitchen and iconic lamps throughout the space. A beautiful interior space is key to swift sale and creating huge interest within a saturated market. If you need help staging your property contact NW3 Interiors to assist you.